Four storey office building with 59 car parking spaces. Excellent location just off Regent Road providing direct access to the M602 and wider motorway network. 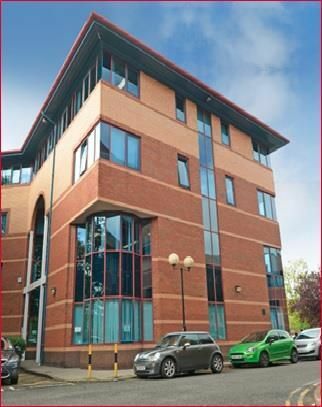 The property comprises a detached, modern, purpose built office building on ground and three upper floors built in 1990. The building is of steel frame construction with brick elevations with aluminium framed double glazed windows. The roof is pitched with artificial slate covering. Internally, the building provides a chevron shaped floor plate with a central service core incorporating an eight person passenger lift. Male and female wc’s are provided on alternate floors with an additional disabled toilet at ground floor. There is a staff canteen to the ground floor. The offices are finished with carpeted full access raised floors, suspended ceilings with recessed lighting and perimeter hot water radiators served by two gas fired boilers located within the roof space. The current tenant has installed comfort cooling throughout the property. Externally, there is parking provision for approximately 59 vehicles and the site provides a total of 0.22 hectares (0.54 acres). The city of Salford is situated in Greater Manchester, 1.5 miles to the west of Manchester city centre and 32 miles east of Liverpool. Salford has a district population of 233,900 persons (2011 Census) and a population of approximately 1 million people within a 10 km radius of the centre. Salford forms part of the Manchester conurbation and enjoys excellent road communications being situated adjacent to the M602 motorway allowing access to the regional and national motorway networks. The M60, M56, M61, M62, M66 and M67 motorways are all accessed via the M60. Salford Quays, a major mixed use urban regeneration project developed over the past 20 years and extends to circa 126 acres. Over 278,000 sq m (3 million sq ft) of office accommodation has been developed and attracted occupiers such as the bbc and itv at MediaCity UK and is now quickly becoming a leading international hub for the creative and digital sectors. The property is held on a 5 year lease from 5th April 2015, expiring 5th April 2020 at the passing rent of £8.63 psf. The property is available by way of assignment or new sub lease.